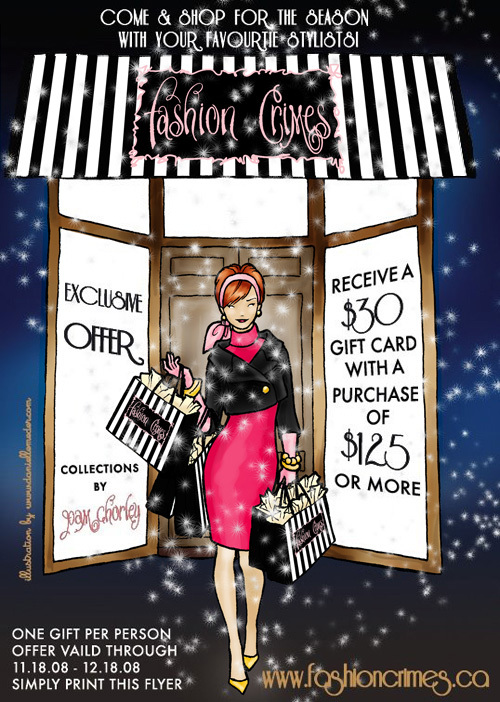 Pam Chorley’s Fashion Crimes is having a terrific sale for the next month – and I had the great pleasure of creating an illustration for the poster. Fashion Crimes is the ultimate party dress store and it is packed to the roof with sparkly treasures. Take some girlfriends and have fun dressing up for the season! The poster is wonderful and sparkly, too, Danielle! Haha, yes! I love that store! Nice job, I really like this !hopefully i can make it. I totally shouldn’t be buying anything else for my selfish-self these days. christmas gifts, though? Love the poster! I haven’t been to your blog for years! I see that you are doing great! How did you create the sparkle in the poster? Illustrator? Hi Judy, thanks for coming back! The sparkly snowflakes were done using a custom brush in Photoshop.